The Regency TR-1, which was the first commercially manufactured transistor radio, was announced to the world on this date in 1954. It was a novelty due to small size and portability, demonstrating for the first time the use of transistors for consumer electronics. Previously transistors had been used only in military or industrial applications. The TR-1 was not a great radio and was not particularly popular, in part because it was expensive. But it paved the way for things to come. By the time I got round to buying a “trannie” as a teenager they were dirt cheap and plentiful. By what is becoming a normal coincidence at this point, the BBC first went on the air on this date in 1922: http://www.bookofdaystales.com/bbc/ I used my trannie to listen to pirate radio mostly, but the beeb was a lot clearer, and I used it often to hear commentary on test cricket from Australia in the wee hours. Two companies—Texas Instruments of Dallas, Texas, and Industrial Development Engineering Associates (I.D.E.A.) of Indianapolis, Indiana—worked together to produce the Regency TR-1. Previously, Texas Instruments produced instrumentation for the oil industry and locating devices for the U.S. Navy—and I.D.E.A. built home television antenna boosters. The two companies worked together on the TR-1 to grow revenues for their respective companies by pioneering this new product area. 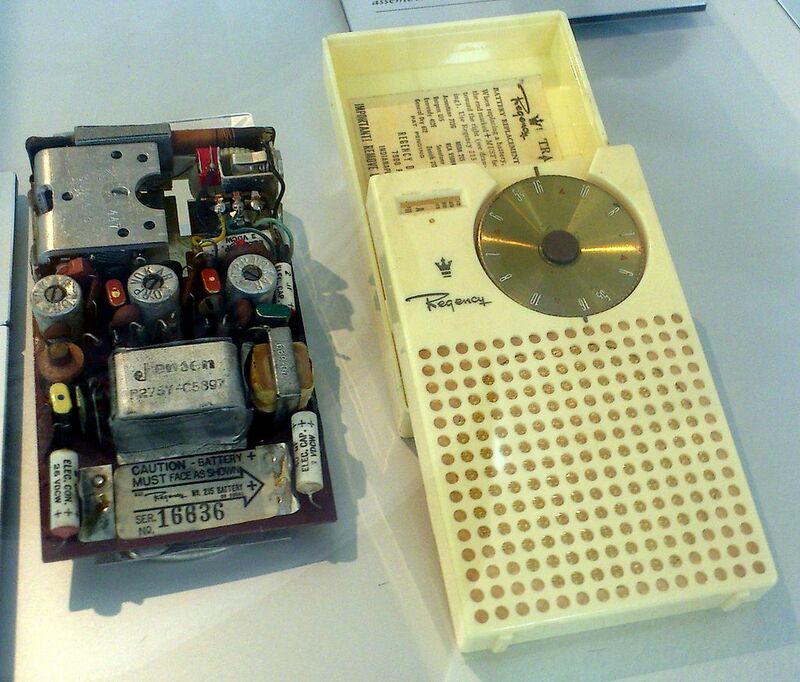 In May 1954, Texas Instruments had designed and built a prototype transistor radio and was looking for an established radio manufacturer to develop and market a radio using their transistors. No major radio maker, including RCA, Philco, and Emerson, was interested. The President of I.D.E.A. at the time, Ed Tudor, jumped at the opportunity to manufacture the TR-1, predicting sales of the transistor radios would be “20 million radios in three years.” The Regency Division of I.D.E.A announced the TR-1 on this date, and put it on sale in November 1954. 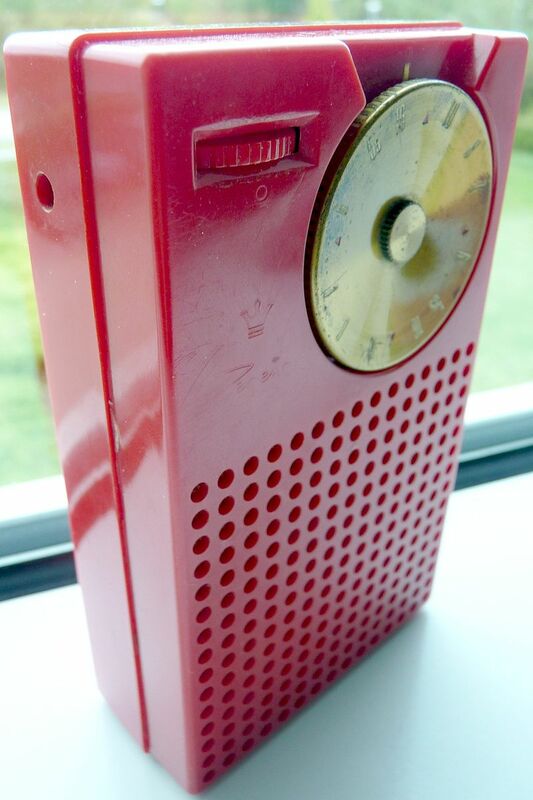 It was the first practical transistor radio made in significant numbers. One year after the TR-1 release, sales approached 100,000 units. The look and size of the TR-1 were well received, but reviews of its performance were typically not great. The Regency TR-1 circuitry was refined from the Texas Instruments prototype, reducing the number of parts, including two expensive transistors. Though this severely reduced the audio output volume, it let I.D.E.A. sell the radio for a small profit. The initial TR-1 retail price was $49.95 (about $460 in today’s dollars) and it sold about 150,000 units. The TR-1 used Texas Instruments’ NPN transistors, hand-picked in sets of four. 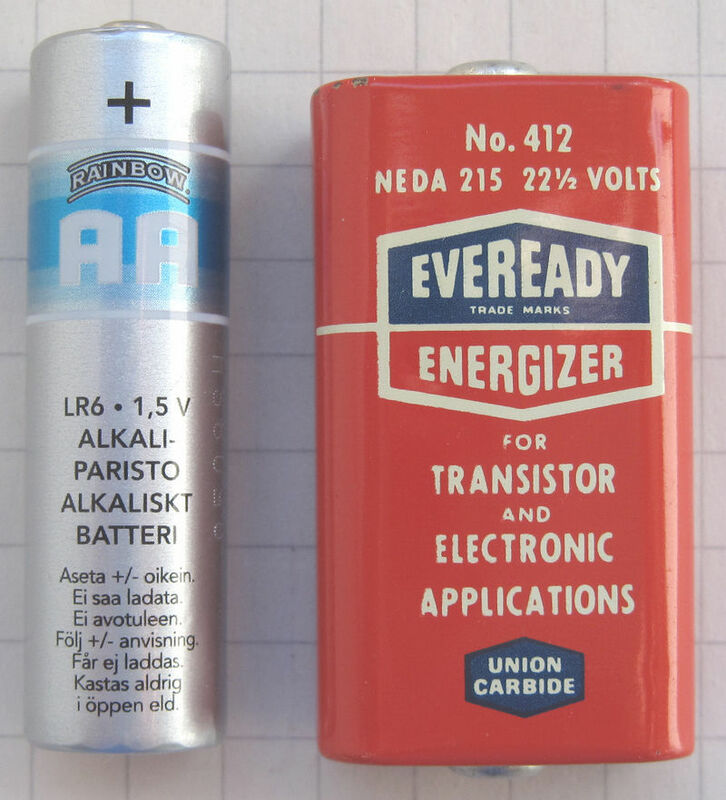 A 22.5 volt battery provided power, since the only way to get adequate radio frequency performance out of early transistors was to run them close to their collector-to-emitter breakdown voltage. The drain from this battery was only 4 mA, allowing 20 to 30 hours of operation, in comparison to only several hours for the portable receivers based on vacuum tubes. Such battery consumption rate still made the TR-1 rather expensive to run. While the radio was praised for novelty and small size, the sensitivity and sound quality were behind the tube-based competitors. A review in Consumer Reports mentions the high level of noise and instability on certain radio frequencies, recommending against the purchase. I.D.E.A. outsourced the TR-1 exterior design to the industrial design firm of Painter, Teague and Petertil. The design was created within six weeks by way of telephone and design sketches exchanged by mail. The design won an award from the Industrial Design Society of New York and was selected by the Museum of Modern Art for the American Art and Design Exhibition in Paris in 1955. The TR-1 was initially offered in black, bone white, mandarin red, and cloud gray. It was later uncommonly offered in olive green and mahogany. Other later, rare colors included lavender, pearl white, turquoise, pink, and lime. It was advertised as being 3″ x 5″ x 1.25″ and weighed 12 ounces including the 22.5 volt battery. It came in a cardboard box with the color stamped on the end. An optional earphone sold for $7.50. 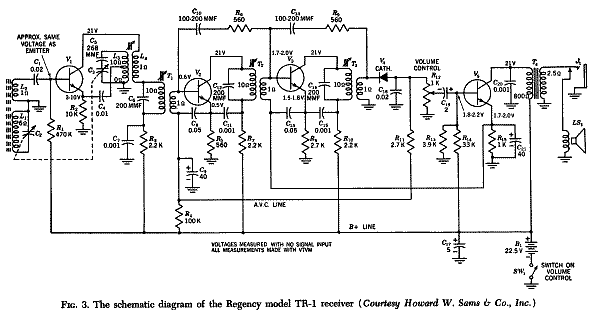 [FOR TECHIES ONLY] The TR-1 was a superheterodyne receiver made with four n-p-n transistors and one diode. It contained a single transistor converter stage, followed by two intermediate-frequency amplifier stages. After detection, a single-transistor stage amplified the sound frequency. All amplifier stages used common emitter amplifiers. Stages were transformer coupled, with tuned transformers for the intermediate frequency amplifiers and a miniature audio transformer for the loudspeaker. The intermediate frequency transformers were paired with capacitors, and hand tuned to the intermediate frequency (262 kHz) using movable cores. The receiver had automatic gain control. The DC level of the detected signal was filtered with a large capacitor and used to control the gain of the first IF stage (VT2, first after the heterodyne). Regency began manufacturing the TR-1 on October 25, 1954. The manufacture was a collective effort by manufacturers around the country. The transistors and transformers came from Texas Instruments in Dallas. Capacitors came from International Electronics, Inc. of Nashville, Erie Electronics of Erie, Pennsylvania, and Centralab of Milwaukee, Wisconsin. The speakers came from Jensen in Chicago, Illinois. IF transformers came from Vokar of Dexter, Michigan. The volume control came from the Chicago Telephone Supply in Elkhart, Indiana. The tuning capacitor came from Radio Condenser Co. in Camden, New Jersey. The Richardson Company in Melrose Park, Illinois and Indianapolis supplied the circuit board material to Croname in Chicago, who manufactured the circuit boards. The plastic case for the TR-1 was produced by Argus Plastics in Indianapolis, Indiana. My early memories of cricket take me back to the days when the only access to the game was through a transistor radio. My dad would intently listen to the audio broadcast on his radio at home and even carry a pocket sized radio he could use on the go. I remember him going on the terrace in hopes of having better reception of the audio commentary and my mom bringing her busy man his tea! This brings back memories of me snuggled under the blankets with my trannie pressed to my ear at 4 am listening to test cricket from the other side of the world. The recipe she gives for smashed potatoes to follow, is good snack food as you listen to cricket – or a good side dish with any main course. The full recipe (with pictures and a chutney) is on the website, but it’s easy enough. 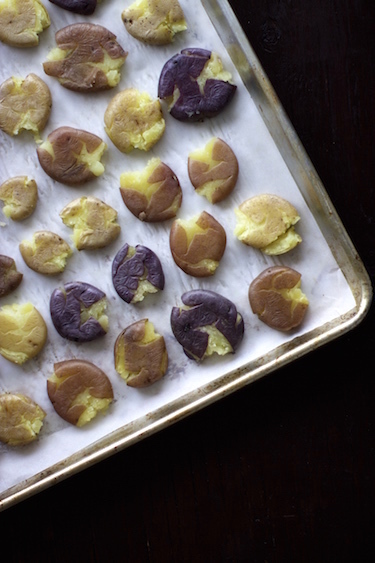 Parboil unpeeled baby potatoes until soft. Squash them and then roast them in a very hot oven until crisp. Serve them garnished with onions and cilantro with the dipping sauce of your choice.